Will there be a Ferris Bueller 2? No. The teaser was for the Super Bowl Commercial. As far as I can tell, there will not be a “Ferris Bueller’s Day Off 2” film released in theatres — the teaser ad getting quite the rave is instead just a teaser for a Honda CR-V commercial by all appearances. I checked IMDB, and there are no entries for anything Ferris Bueller for 2012, not even a post-production project — unless it’s code-named something else to throw us off (but that would be a terrible idea). Honda has, however, released a lengthier version of the commercial already, which re-creates some of the scenes from the first film. To be fair, I think you should keep a keen eye out that Honda hasn’t made any reference to anything about a “Ferris Bueller 2” or anything of the kind — the attention-grabbing users who upload clipped version of the original teaser have been titling the video as movie trailers are not from Honda and are merely trolling crazed nostalgics into an uproar. By all appearances so far, especially from lack of any coverage of a Ferris Bueller 2 pre-production, post-production, or anything-production project from any upcoming-film site that I’ve been able to detect, the Superbowl advert is all there is. But even still — could the buzz instead be a toe-testing-the-water ploy to see whether America is ripe for green-lighting a Bueller 2 feature film? 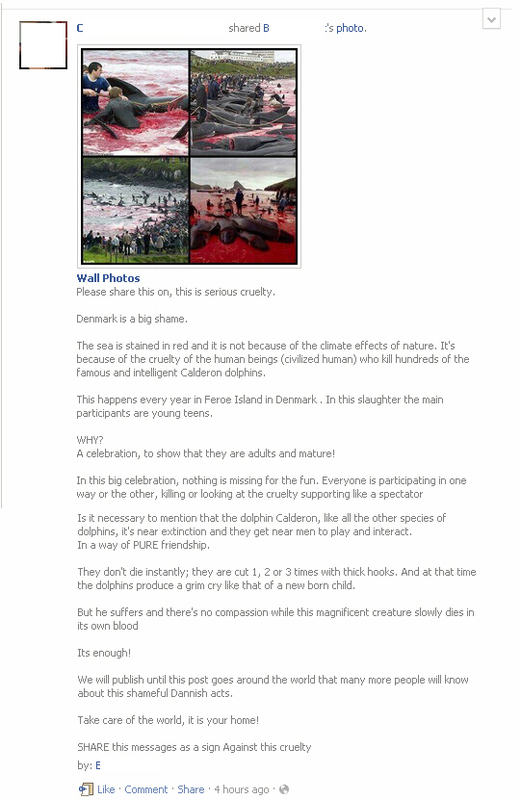 Is the Dolphin Hunt in Denmark Cruel and Illegal? There’s a Facebook post making the rounds that came from an email forward from about 2009, according to this Snopes article. The problem with the post is that it contains several factual errors and seems to rely upon speculation and emotionally-charged accusations instead of verifiable sources. The Faroe Islands are not in Denmark. The Faroe Islands, while in proximity to Denmark (out into the ocean and quite a distance north) and under the larger Kingdom of Denmark, have their own individual government and regulating body — similarly as Northern Ireland is not governed by England while still within the United Kingdom, per se. It doesn’t happen every year. It’s not a single event where whales are mass-slaughtered, there are generally several attempts over the period of a year, bringing 50-100 with each attempt. Most attempts happen over the summer months, and the totals are cumulative yearly — not all in a single catch. The practice isn’t cruel. At least, it’s not cruel as far as slaughter of animals is concerned in general. The practice is heavily regulated so that established techniques are followed in order for the practice to continue without undue concern from protection groups. Nowadays, the hooks are actually blunt-tipped and the whales are apprehended by with the hook by the blowhole (like a nostril), not stabbed. Only the whales that are already dead are handled with the sharp hooks. Once brought ashore, A section of their spinal column is cut so that death comes on quickly, usually in less than a minute to minimize suffering as best as possible. The cut also severs an artery, so there is a lot of bleeding. In my estimation, a well-practiced spinal cut and bleed-out wouldn’t be a terrible way to go — suddenly going numb and seemingly falling asleep from blood loss. It might be suddenly frightening, but if it came unexpectedly like a car accident, I wouldn’t have worried my whole life about it. In comparison to other, more contemporary forms of livestock, these whales spend their whole lives in the natural habitat of their own selection rather than cramped, confined, man-made dwellings and do not experience stressful transportation or rough handling by impersonal machinery while alive. The catch lasts perhaps a few minutes and is unexpected, having lived and bred among their own in the wild. They’re not caught in painful traps or mishandled in ways that haven’t already been heavily regulated in response to advocacy groups. There’s no risk of endangerment. The operation is communal (not commercial) so Islanders are permitted to participate if they wish, and the catch brings in around a thousand per year — whereas estimates of the overall population suggest around 200,000 exist of the short-finned variety, and about 1,000,000 of the long-finned sort. My favorite Korean girl-pop group Girls’ Generation known to hipster American fans as SNSD, the initials for their Korean name, So Nyuh Shi Dae.. will be performing on the David Letterman show on January 31, 2012 and then the following day on Live! with Kelly (formerly the Regis and Kelly show) the next morning! 1. I’m so impressed with their English! 3. Why did I listen to ablestmage back in November 2009 when he first mentioned it? 1. Release versions both with and without vocals — it essentially doubles your sales opportunities, and prevents cheesy karaoke versions that butcher the originals. There are a lot of us out there that really like the music of songs by popular artists, but are turned off by the vocals (Nickelback comes to mind). If there was a instrumental version option, I would buy all of their albums flat out. You’re totally just throwing away a gigantic potential source of revenue. 2. Research how deep the following is for SNSD and recognize how dedicated fans are to recording and sharing things even like commercial spots and random event footage they appear in. If you were able to cull all of these clips into a central location, fans could celebrate their fandom of a group without having to use filesharing services to swap recorded clips among each other, which are difficult to share with people on Facebook and such because of their technical nature. You’re completely discarding BRILLIANT advertising revenue potential by avoiding it. 3. Take a giant clue from the Korean system by creating a weekly or nightly live performance popularity contest (Inkigayo, for instance) by which a lot of artists perform on stage before giant live audience and people can vote on their favorites. It’s a perfect opportunity to ride on the American Idol demographic, but doubles as a chance for American fans to be able to see their favorite artist AND be exposed to live performances of similar artists in a tour-style setting for cross-promotion. I am completely baffled as to why this kind of thing doesn’t exist already. It’s kinda like the musical guest for a late-night talk show, except the show is all about musical guests and not interviews. There are plenty of interview shows like Letterman and the Tonight Show. Give us a musical guest show of established artists and let us vote.. let us feel as if we have an active say in our favorite music! 4b. Drastically shrink the size of albums (as far as track number), and release only a few tracks, and spread it out over a year. You could spread an album of 12 songs instead out into maybe 3 albums of 4 songs each. Focus more on online sales and go digital. CREATE RARITY with physical copies by producing limited sets, and the demand with shoot up. The fact that every mom and pop shop can get their hands on a hard copy is part of what makes buying physical discs increasing lame, and reduces the value of owning the real thing. 5. Make “making-of” DVDs for each single. You guys are totally missing out on a giant source of revenue by only releasing a single album for a group, and pretty much nothing else but random tours and occasionally appear on a show more focused on celeb interviews with music as a filler. Establish a massive and engaging “fanservice” arm of promotions, by offering us loads of audio-video goodies to buy, not just clothing. 6. Gives us more multi-person groups instead of almost strictly solo artists. SNSD is a perfect example of how the Backstreet Boys or NKOTB formula still works, but try it with girls this time. Gives us opportunities to vote on our favorite (perhaps by including voting tickets in with physical album sales), who can then have a prominent solo-ish portion during a weekly/daily performance as described in #3. 7. AUGMENT THE TOUR CONCEPT. Tours can create FRUSTRATION with fans because they can’t see their favorite bands live due to limited seating, distance, absurd ticket prices, and stage setups limited to the local venue’s resources and acoustics. Create instead only periodic, rarer live performances outside of the #3 suggestion, in a massive single venue in regionalized points around the US, and not in some major city, using modular Woodstock-ish set-ups that are company owned and not governed by just whatever is available. Why only offer such limited seating to a showing of a band, when you could have OCEANS of fans coming to see the group. How is OCEANS of paying fans not better than sold-out seating? SOLD OUT means you LOST POTENTIAL REVENUE. In addition to tours to give us a more personal feel, be way more interactive with fans with contests, voting opportunities, and general PR that just some lousy commercial for an album. 8. Get on the ball with sponsorships, in a big way. SNSD does a lot of sponsorships — and in some cases create/performs songs specific to that sponsorship, such as their Intel “Visual Dreams” track (below)..
..not only do you get a sponsorship fee, but you also get an opportunity to release that sponsorship opportunity AS A TRACK or even its own special promotional album, to increase incoming revenue. Fans are so into collecting SNSD advertising, the Vita 500 energy drinks and even commercials for regular things like Domino’s Pizza are great additions to artist collections. SNSD is bringing an incredible and engaged industry along with it, and the American pop industry DESPERATELY needs to take a giant HINT on how to run the game stateside. I haven’t purchased anything from the music industry in a really long time partly because the PR and fanservice is so dreadfully uninteresting and unengaging. SHAPE IT UP! “Ladies, it is that time of year again! It is time to raise awareness for Breast Cancer. Remember the status about our bra color or where we put our purse?? It made more people aware of the problem as it went viral on FB and made the news. Don`t tell any MEN what the status means! Copy, paste and resend this message to all your girl friends, let`s see if we can make it work like before, keep them guessing, let`s see if we make the news! The idea is to use your birthdate, month and day only, no year! Write: “I am going to live in (see corresponding city for your BD month below) for (day of your BD) months and a happy face. Petition To Dr Pepper About Shutting Down Dublin? Read This First. In north Texas, there’s a town called Dublin — famous for its primary industry, a bottling plant that has produced and distributed the Dr. Pepper brand of soda for the longest of any current distributor, around 120 years in operation. The Dublin distributor made a name for itself and had quite a loyal following among “Peppers” (people who drink Dr. Pepper) who would seek out cans and bottles distributed from this single plant. The Dr. Pepper/Snapple company (hence DP/S) recently came down on Dublin, on a trademark dispute, regarding Dublin‘s decision to break contract. The reason Dublin Dr. Peppers are leaving the market and the reason the Dublin plant operators are losing their livelihood — is because of their own decision to purposefully break contract by (a) distributing out of territory, and (b) using a custom Dr. Pepper label.. is what brought the hammer down, not DP/S trying to ruin our fun. In the same way that a landlord has complete liberty to evict you if you bring pets into property you’re renting, when the rental agreements states that pets aren’t allowed — so does DP/S have complete liberty to shut down operations that break contract with the original agreement. Dublin Dr.Peppers would still be around if Dublin Dr.Pepper had kept to the agreement. The reason a dam holds up a river so it won’t wash a town away, is because of the strength of the dam. When you take away pieces of the dam, you risk drowning the town. When you have a peace treaty with a superpower, but go against the terms of the treaty by your own, willful decision, you bring upon you the threat of annihilation. When you make an agreement with DP/S to distribute their product — and it is DP/S’s product, not yours — but you decide to break the terms of the agreement, you, yourself, risk destroying the market you’ve built and secured. Laying blame on DP/S for taking down Dublin is like blaming the water for flowing down on you after you yourself destroyed the dam! It’s like throwing a rock up into the air, and then blaming gravity for when it hits you on the head as you walk away in ignorant, peace of mind! It’s sad that the town of Dublin is losing its major industry, and that the people there are losing their jobs — yes, we agree on that — BUT THE BLAME GOES TO DUBLIN. Dublin created their own label, and created a kind of contraband market for their contract-breaking label that should not have existed in the first place, according to the agreement they had with DP/S. Grievances should be directed to those who created this false-market of Dublin-branded Dr. Peppers, not DP/S for enforcing the original terms of the agreement. Note, however, that DP/S does still sell the sugar cane variety of its Dr. Pepper soft drink, but just through a different distributor (who can actually obey the rules) so the sweeter tasting, non-HFCS formula isn’t disappearing from the market — just the “Dublin” brand label is leaving.